The first international competition for fingerprint verification algorithms (FVC2000) was organized in the year 2000. The great success of the event prompted the organizers to set up similar competitions in the following years: FVC2002, FVC2004 and FVC2006. Beginning with FVC2002, to increase the number of companies and therefore to provide a more complete overview of the state-of-the-art, anonymous participation was allowed. The interest shown in the FVC testing program by algorithm developers is steadily increasing: in the fourth edition (FVC2006), a total of 70 algorithms have been evaluated by the organizers. 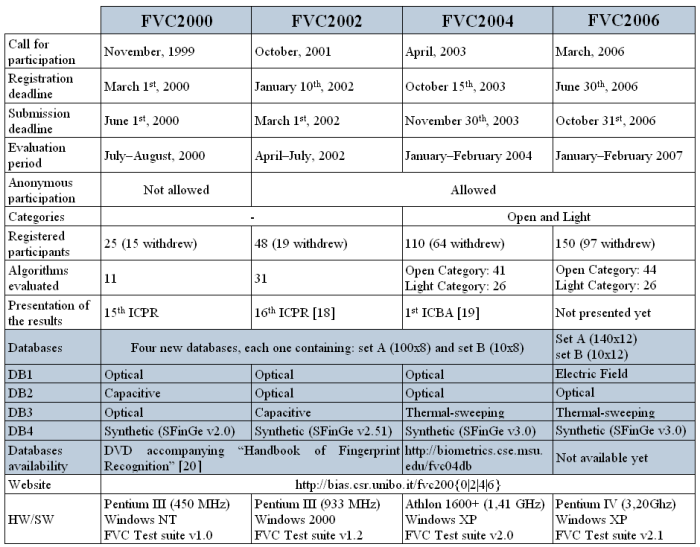 FVC databases are nowadays the most widely adopted benchmarks for fingerprint recognition.